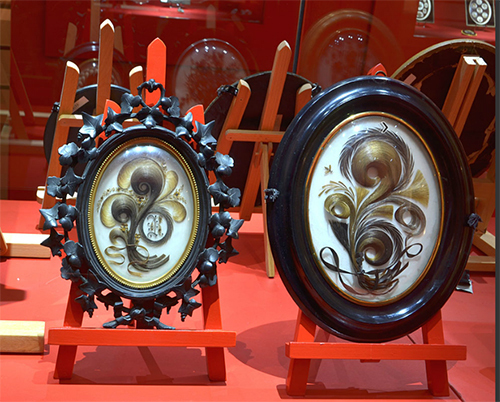 The Creative Museum just played a significant part in another exhibition at the Montelimar Miniature Museum. STONES, LEAVES, SCISSORS is about hair ornaments made in three different ways. Whether an artist looks at a piece of jade and carves a crown, looks at a piece of silver and cuts leaves into an intricate pattern, or takes lock of hair and puts it in a locket or medallion — each method of craftsmanship is showcased. 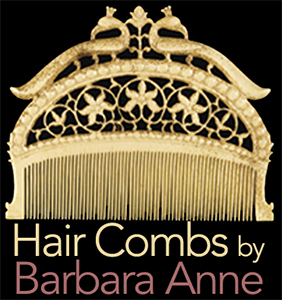 The ground floor is dedicated to semi-precious stones on hair ornaments. 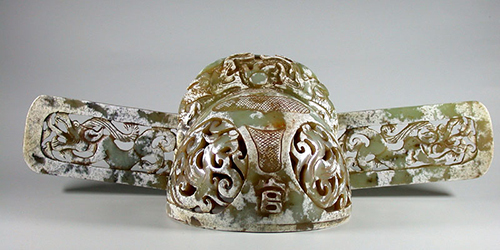 This Chinese jade crown made in the Qing Dynasty and decorated with a phoenix is a great example. Dragon figures were male symbols. 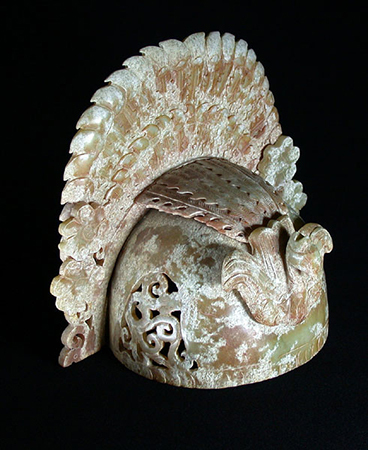 When they were carved on a crown’s side wings, it was a sign of a well-read Chinese man. The wings could also be upright, as in this example of open-worked pale green jade. 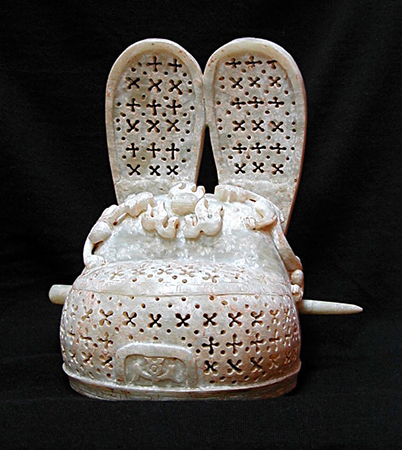 The solid parts are carved with dragons, which are also an emblem of power. 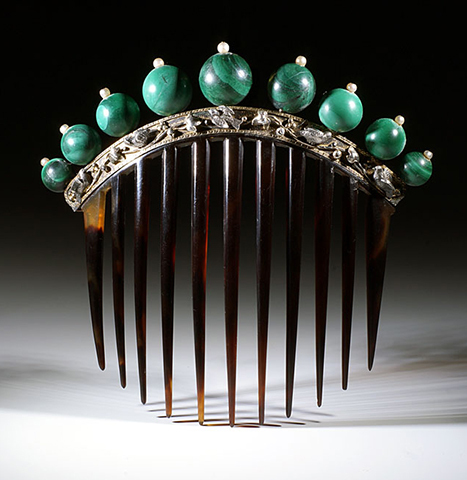 Jade stone was supposed to help deceased people reach heaven, so a jade comb was added to other burial objects inside the tomb. Transparency is one of its qualities. Its infinite shades — such as olive green, almond green, pinkish brown, or orchid white — are endless. 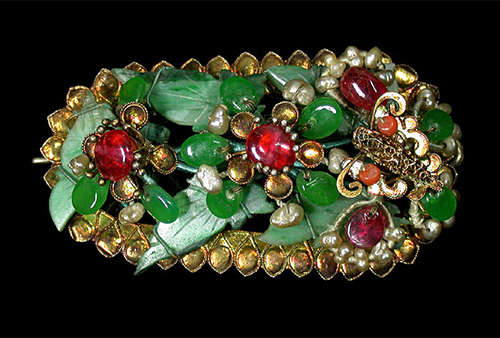 Women wore jade on more discrete ornaments. They usually preferred jadeite, which was less expensive and enjoyed the vivid green color against their jet black hair. This delicate hair ornament is for a “liang-patou” (large hair knot or black silk knot) and is richly decorated with gems and pearls. Note the little butterfly with a coral bead on the tip of its antennas. 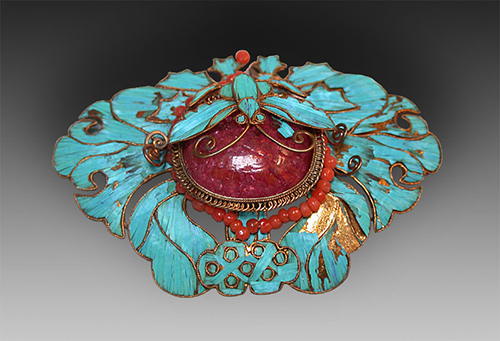 From China again, these bright pink tourmalines strengthen the dazzle of the bright blue kingfisher feathers inlaid in Manchu adornments. 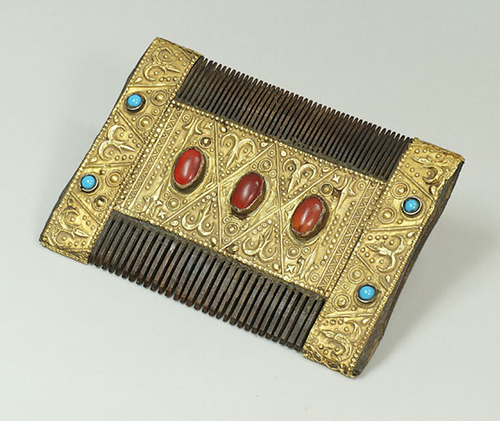 In the same museum case, we added the brick red of cornelian from central asian adornments such as this double-sided Turkomen wedding comb, which is made of wood covered with embossed brass and decorated with gemstones on both sides. 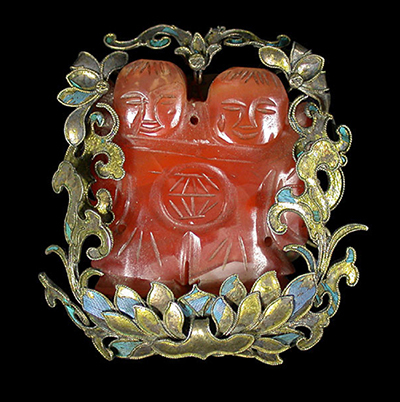 We also included another liang-patou ornament, featuring twins carved in amber inside a lotus flower. 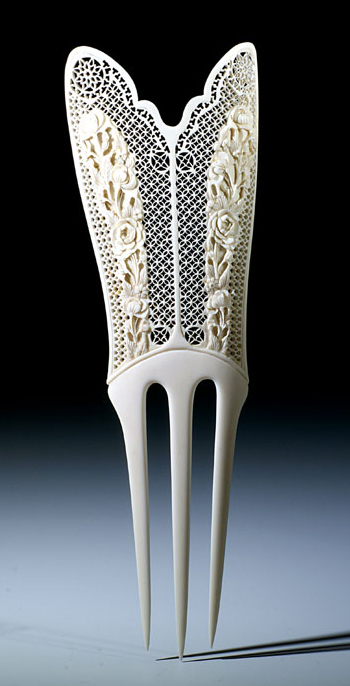 The flower was once fully inlaid with kingfisher feathers. These figures are symbol of fertility. 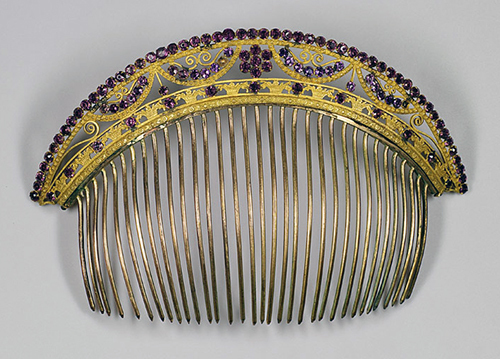 The red garnet and the purple amethyst meet on Western pieces such as these two French Empire combs, one of glass stones, and the other sporting real amethysts. Our Indian hair pin with opal and ruby, tortoiseshell Eugenie comb with malachite balls, and our theatre tiara with crystal quartz complete this colored collection of stones, a real must for any jewelry collection. 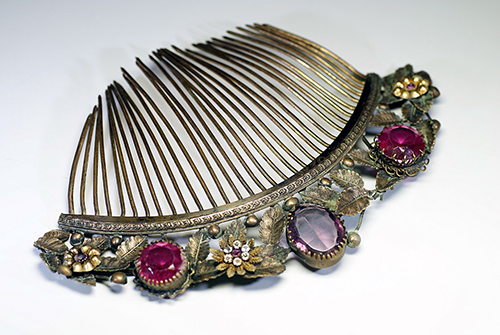 The leaves theme shows the use of floral design on hair ornaments, complex decoration that required highly skilled craftsmen. 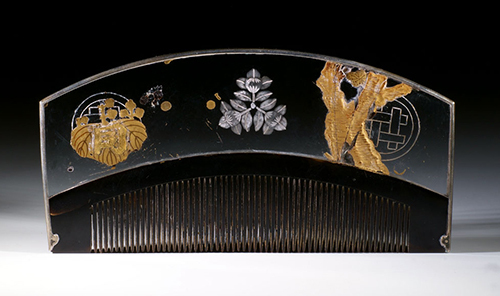 In the museum case, Chinese mirrors shine like bright stars next to hair combs decorated with branches and leaves. In Japan, nature has always been at the forefront of artists’ inspiration. 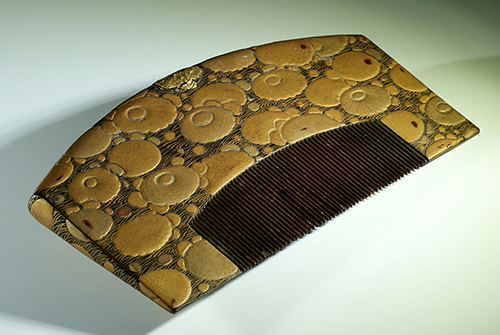 This comb from Dejima painted with branches and leaves, and our Edo comb with chrysanthemums are perfect examples. 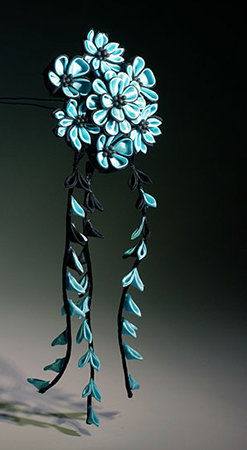 Tsunami kanzashi are hair pins whose flowers are made with folded silk squares. 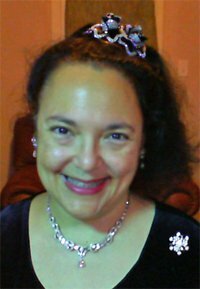 When older women have formal parties, they favor traditional dress. 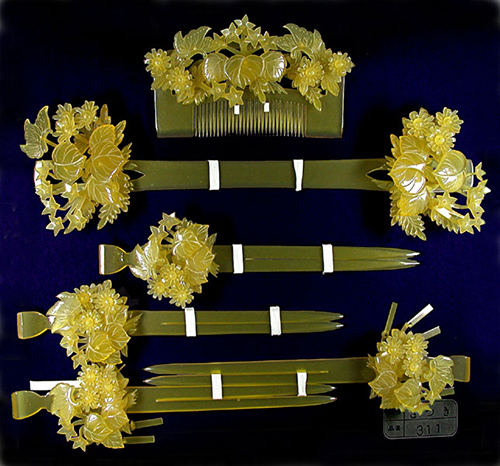 They love older style kanzashi wedding sets. 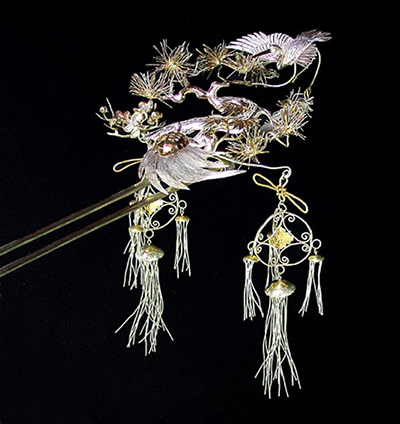 This silver wedding kanzashi portrays the long-living turtle Minogame and the crane, symbols of longevity and happiness. 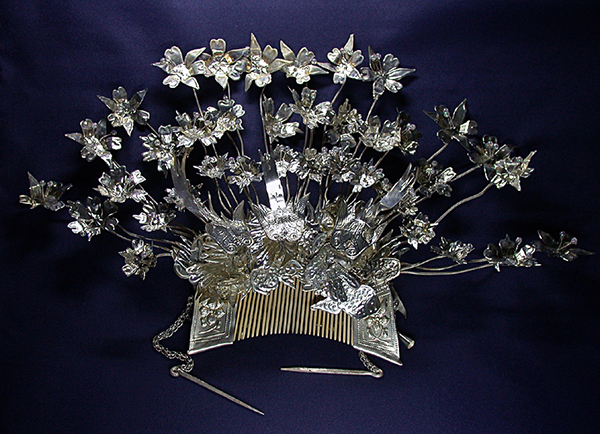 This wedding headdress with exuberant blooms comes from the Miao people, a Chinese minority. It is part of a bridal dowry, and it would have been considered sacrilegious to have taken it away from the bride for any reason. 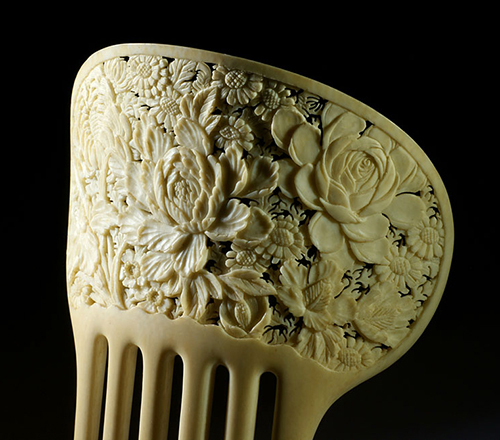 In the late 19th Century, Chinese craftsmen, who were expert at carving ivory and tortoiseshell, made ornamental combs for the Western market. Flowers like the lotus, a symbol of purity; the chrysanthemum, a symbol of longevity; and the rose, a symbol of luck; were the most popular designs. 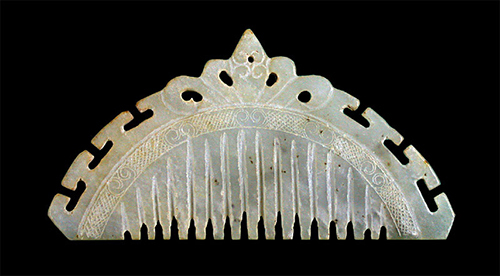 On this hair ornament from Burma, the decoration appears like a flower and leaf bridge. A spectacular headdress brings to an end, the leaves theme. 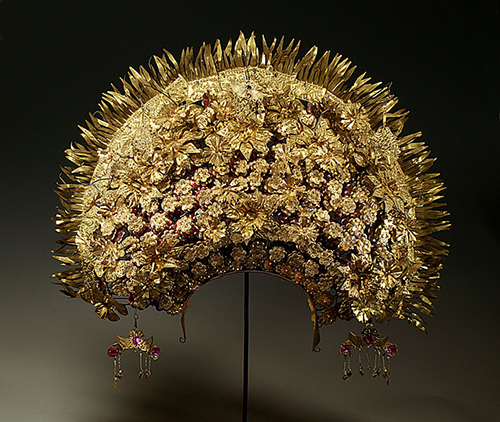 It comes from Sumatra, weighs 3.3 pounds, and is worn for weddings. Each element is a flower, mounted on a spring stem, decorated with tiny leaves. 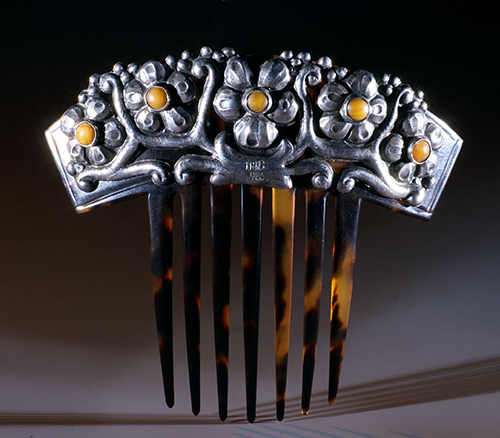 Today, we are surprised to see hair used as a material for jewelry, but it was very common in Victorian times. 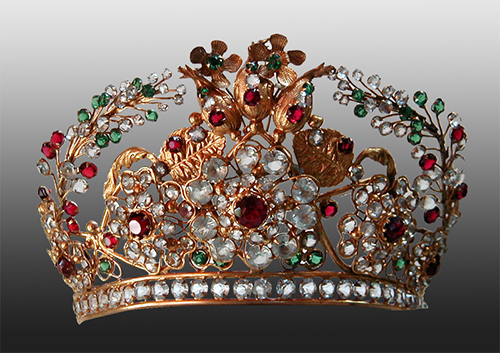 Bracelets, necklaces, brooches, even diadems were made with it. The British and French deeply appreciated wearing medallions with their initials: charm drops, pendants, and collar and cuff buttons made of woven hair. 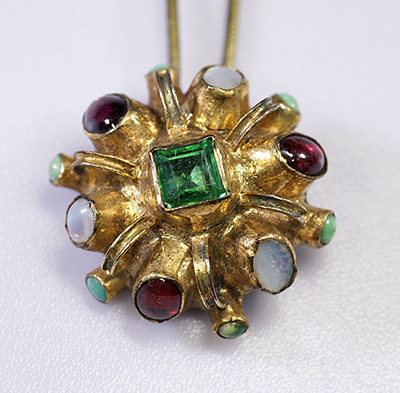 Medallions were often made as reliquary, which kept the permanent memory of a loved person. The traditional motif was a tomb with willow tree and cyprus as symbols of death.